Update August 4th, 2011: I've changed the script to use any of the three OpenStreetMap tile servers, instead of hard coding it just to one. I like taking pictures, and I usually take a GPS so that I can place them on a map on my Flickr page. On my last excursion however, the battery of my GPS had died, so I did not have location information available to store in my pictures' EXIF headers. 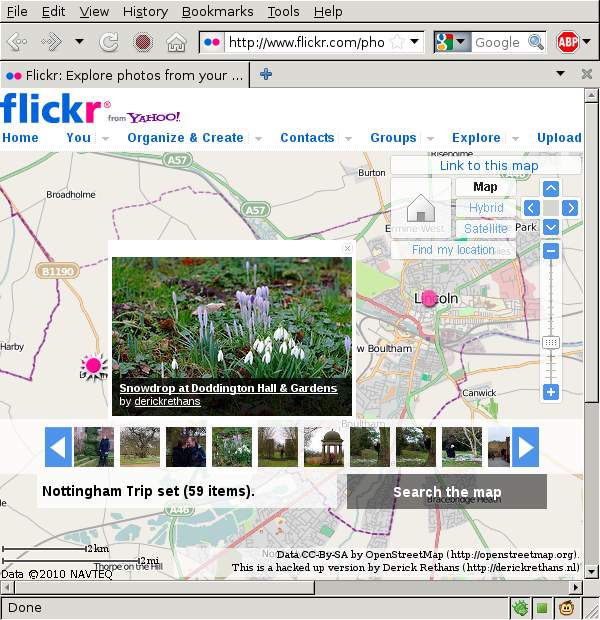 Flickr can use the EXIF headers to then show the images on the map. Because I did not have the location information to automatically place my pictures on the map, I wanted to do that by hand. Flickr, being owned by Yahoo!, uses Yahoo! Maps. Yahoo! Maps however, is not terribly great in the country side. Actually, it is mostly empty, especially compared to OpenStreetMap's version. This made placing photos onto the map by hand quite impossible. So I set out to have only OpenStreetMap tiles as back ground in Flickr like they already do for Bejing and some other places. Squid will fire up a few of those scripts (depending on the url_rewrite_children setting) and then supplies them with URLs to rewrite. Each line of input is an URL to rewrite, and the script should echo a rewritten URL. And with the OpenStreetMap tiles in the background, I could place my photos on the correct location on the map. I love this, but using Squid (which really isn't that great of a caching proxy) is just too heavy. Have you looked at creating a Greasemonkey script? @Stefan: GeoSetter is a Windows application, it uses Google Maps and it requires a GPS track. I have none of those prerequisites.